A yet another strong show by Jaguar Land Rover (JLR) helped city-based Tata Motors, India’s biggest automobile manufacturer, report a 213 per cent jump in consolidated net profit for the quarter ended June at Rs 5,398 crore, against Rs 1,726 crore in the corresponding quarter last year. As the profit beat the Bloomberg consensus estimate of Rs 3,776 crore, the Tata Motors stock rose, closing 3.33 per cent higher on the BSE. A wholesale volume increase in the case of JLR; a richer market mix, backed by an increase in emerging markets; and a rich product mix, supported by the success of the Range Rover Sport and the Jaguar F-Type, helped the Tata group company increase net profit. 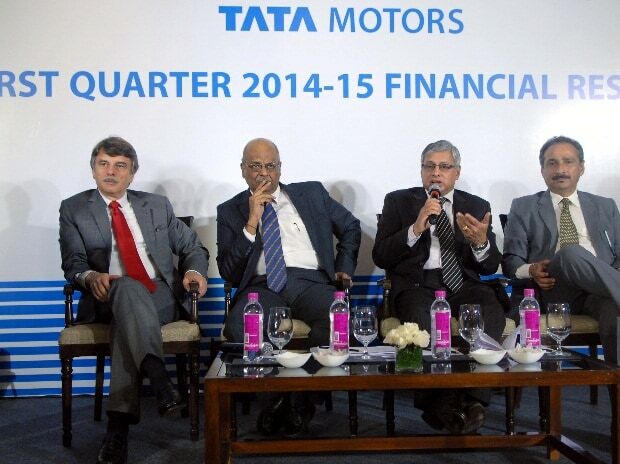 Tata Motors’ net consolidated sales rose 38 per cent to Rs 64,683 crore from Rs 46,796 crore in the corresponding quarter last year. With China, JLR’s most profitable market, accounting for 30 per cent of wholesale sales (21 per cent in the year-ago period), the consolidated operating profit margin of Tata Motors improved to 18.2 per cent from 14.5 per cent a year earlier. Margins in China are expected to take a small hit, with the local government directing a few luxury carmakers such as JLR to cut prices, after these were found to be overcharging. Last month, JLR cut prices five-seven per cent. The poor performance of the standalone entity, however, continued in the June quarter. At the standalone level, Tata Motors saw its net profit drop 44 per cent to Rs 394 crore from Rs 703 crore in the year-ago period. The drop was largely offset by the Rs 1,597-crore (£150-million) dividend received from JLR. While operating loss stood at Rs 298.14 crore, against a Rs 105.19-crore profit in the corresponding period last year, net sales fell to Rs 7,705 crore from Rs 9,105 crore a year earlier. “Macroeconomic factors continued to impact demand for the entire commercial vehicle sector. The company under-performed the sector, largely because it corrected inventory across channels for providing maximum room for new products in the second quarter, namely the Zest,” the company said. At the standalone level, volumes declined 26 per cent to 108,296 units from 146,988 units sold in the corresponding period last year. During the same period, JLR’s wholesale volumes increased 27 per cent to 115,156 units. For the June quarter, JLR’s net sales rose to £693 million (about Rs 7,000 crore), a rise of 128 per cent against £304 million (about Rs 3,000 crore) in the year-ago period. During the same period, the company’s operating profit margin improved from 15.8 per cent to 20.3 per cent. Tata Motors is seeing a revival in commercial vehicle sales and is, therefore, hopeful the Zest (its new compact sedan) will lead a turnaround in the passenger vehicle segment. On the JLR front Tata Motors will launch the new Discovery Sport, the Jaguar XE and the Ingenium family of two-litre engines from a new plant in the UK. Its new joint venture plant in China has already started operations.